When people ask me for advice on buying camera equipment, I always try and let them understand how important your glass (lens) is. The sad thing with companies almost brainwashing consumers into being part of the "Megapixel-race" is that consumers more than often spend most money on a camera body and only leave a little or no money for lenses. In my opinion its the wrong way of going about buying camera gear. Some people use the excuse of not being able to take great photos because of their equipment, but this is not true. All of these pictures were taken on Sigma lenses which have always been the 'cheaper' alternative and you can see in these pictures its a very good option. I believe the results speak for themselves. 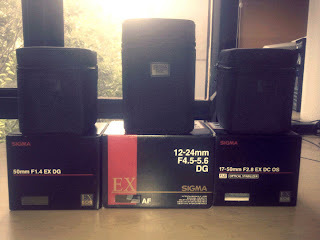 Sigma have been producing more and more good quality glass. I really enjoyed the Sigma 50mm lens, because of its very good depth of field and it suited my shooting style. The Sigma 12-24mm is crazy wide. Also a very good alternative when you don't need f2.8. I just love the 8mm Fisheye. Your creativity can run free and make beautiful pictures. Not a lens you can use every day and you have to use it very wisely as it distorts a lot at the edges. Some of the settings might look weird, but I was trying to test the lenses fully.